The US has urged Iraqi authorities to put an end to the country’s dependence on Iran for energy as the White House seeks to replace Iranian suppliers with American companies, The New Arab reports. 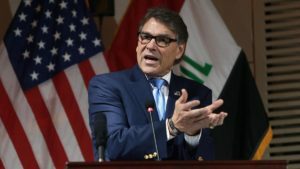 “The time has come for Iraq to break its dependence on others and move forward toward true energy independence,” said US Secretary of Energy, Rick Perry after meeting with top Iraqi officials in Baghdad and in the Kurdish region on Tuesday to discuss US investment in Iraq. The US has given a waiver to Iraq to continue temporarily importing energy from Iran despite new US sanctions on the Islamic Republic after President Donald Trump tore in May the 2015 nuclear accord between Iran and world powers. Iraq, during the 45-day waiver, will look for alternative energy sources. The Middle East country, one of world’s leading oil exporters, highly dependends on Iran for its energy needs. 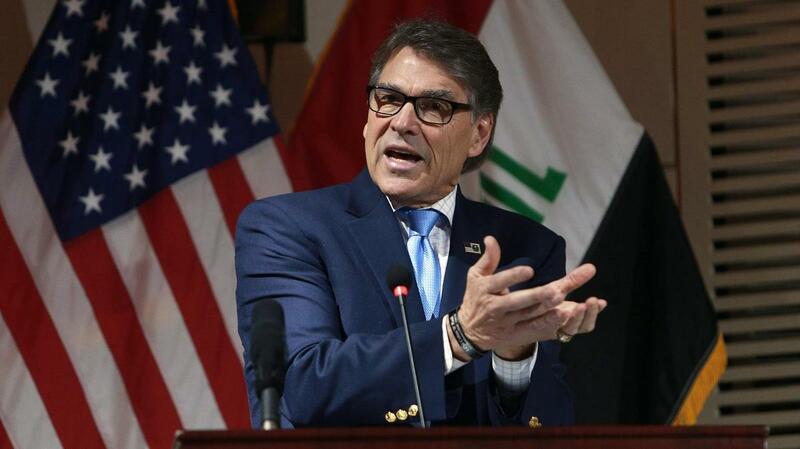 US firms, Perry said, were prepared to help Iraq develop its own energy sector, the London-based media reports. Posted by KanelkaTagba on Dec 12 2018. Filed under Energy, Headlines. You can follow any responses to this entry through the RSS 2.0. Both comments and pings are currently closed.